Happy New Year! Okay, so we've been all up in 2014 for over a week now and it's probably time to stop saying that, but seeing as I haven't been on here in ages I thought I'd throw one out there. My number one goal this year is to put a lot more into this blog - I really enjoy doing it and I've had some really positive comments from you lot so thanks for that. I'm kinda-sorta getting married in a few months, and I kinda-sorta feel like I might be a little pre-occupied...but I'm gonna try my darndest - still gotta eat right? Anyhow - here's a good one to kick of 2-0-1-4. Curing my own bacon is something I've wanted to do for a while now. I think it's a bit of a foodie rite of passage, like nailing your first chocolate souffle (done) and brewing your own beer (still to do!) As it turns out, it's really easy to do - just takes some time and a bit of patience. And a lot of brown sauce. 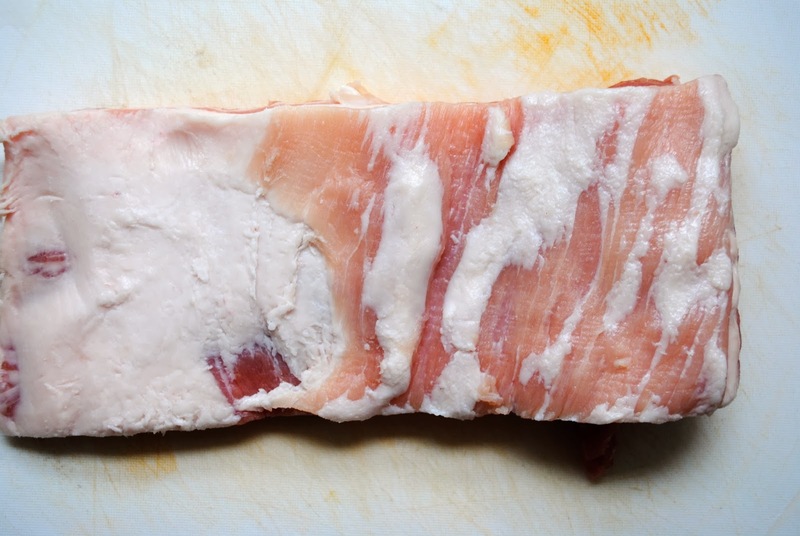 Take a nice bit of pork belly, carefully remove the skin and much of the fat. Don't bin the skin, bag it up and stick it in the freezer - the next time you want a bit of crackling simply defrost and cook in a hot oven for about 50 minutes. Goes great with a roast dinner, but if you want to cook it up and eat it on its own I won't judge. Not one little bit. Now you gotta make your dry cure. The curing process takes about a week and will preserve and flavour the pork belly. Provided you've got a good amount of salt in there you can make a cure out of pretty much anything - I've had a chance to try a couple variations and this is a recipe I really enjoy. 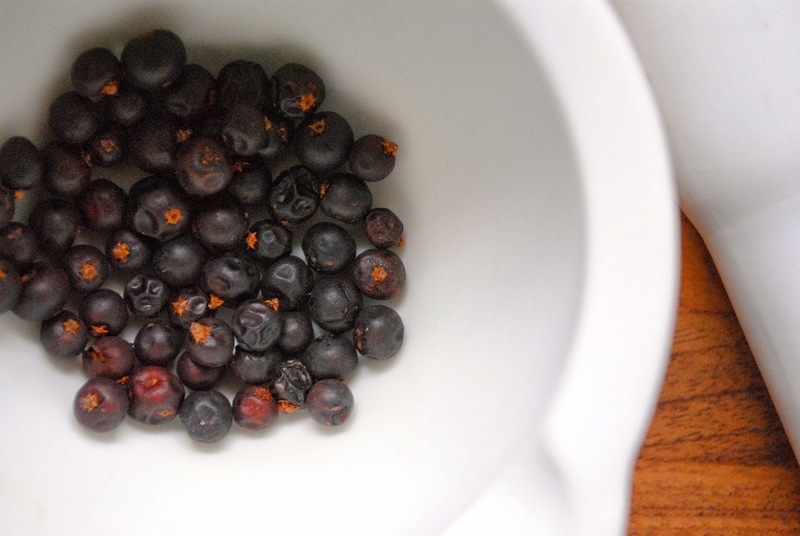 Start with about 2 tablespoons of juniper berries - these have a brilliant pine flavour which works great with all kinds of meat, but especially pork. Crush them up using a pestle and mortar. Once you've given the berries a good pounding add 1/2 cup salt, a few tablespoons of brown sugar, the same of black pepper, and then 1 tablespoon of sage. Give it a good stir and mix all dem nice spices up. 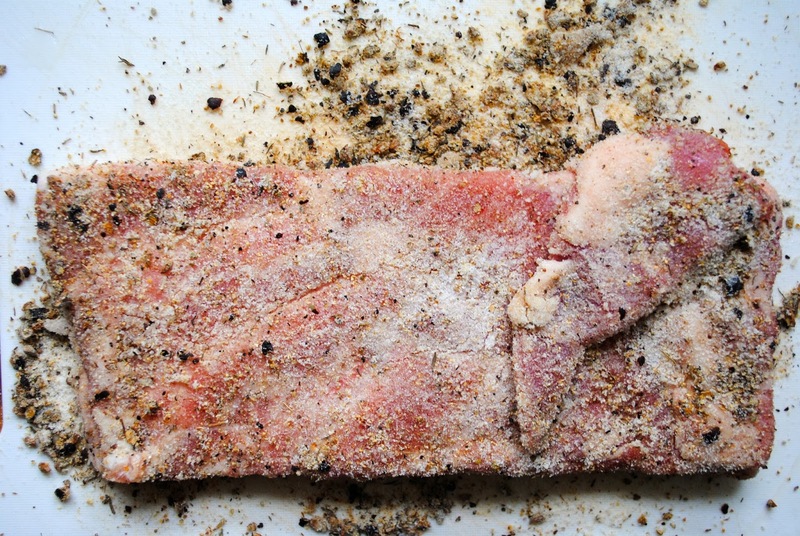 Take your dry rub and massage it into the pork belly, making sure to get into all of the little nooks and crannies. Don't act like you're not enjoying this part. Seal the pork in a food bag and pop it in the fridge. Now it's time for the hard part - the waiting. Give it about a week in the fridge, leaving sealed in the bag and flipping over each day. The salt will draw a lot of the moisture out of the meat, so watch out for leakage. You do not want to be cleaning that out of your fridge. After a week, remove the pork from the bag and give it a good rinse under the tap. Pat it dry and then stick it back in the fridge overnight - this will dry it out and also firm it up, so it's easier to slice. And that's makin' bacon. I found that an electric carving knife works perfectly to slice some nice thick rashers. Or, if you're feeling brave, a sharp knife and a steady hand should do the trick. There really is only one way to enjoy a good bit of bacon. Treat it to a nice, floury bap, plenty of real butter and a good squirt of HP. Bliss.